Our personalized leather belts are available in a wide range of designs and font choices, so no matter what your tastes, you’ll find something you like in our online store. Those with traditional country and Western tastes will appreciate our many country and Western styles, including the Country Boy, the Country Girl, and the Texas Country Girl. When you buy one of our leather belts made in the USA, you’re supporting the American economy. You can show your patriotism in more ways than one when you choose one of our Eagle designs. Choose the Eagle, the Eagle Spread, the Painted Eagle Spread, or the Eagle Sunrise Painted. 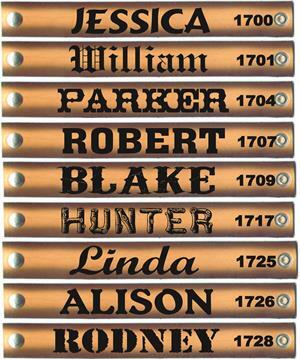 Our get your name tooled onto a personalized belt with an Eagle Sunrise design. No matter what’s most important to you, or to your friend or loved one, you can customize one of our western leather belts to express it. Show your faith in God, declare your love of nature, or voice your pride in your favorite hobbies or career. Shop our customize leather belts today.